You may wish to see an introduction to this section or page one first. It is possible that both these harbours were originally united, and that a wall which now separates them, was built after the outer mole had yielded to the ravages of the sea. In this case the entire harbour would have been about 500 yards long; a most spacious station for the galleys of the Sidetians, who, it appears from Livy, were famed for their naval skill and prowess. 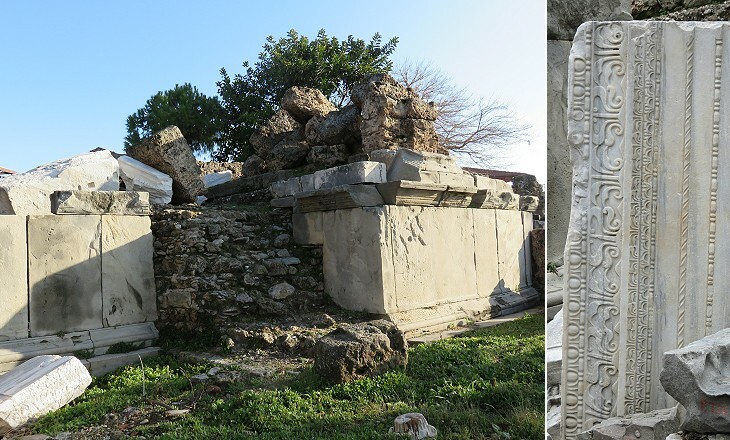 The Temple to Apollo which stood on the edge of the ancient harbour was partially reconstructed in the 1980s. It has become the landmark of modern Side, even more than its theatre. 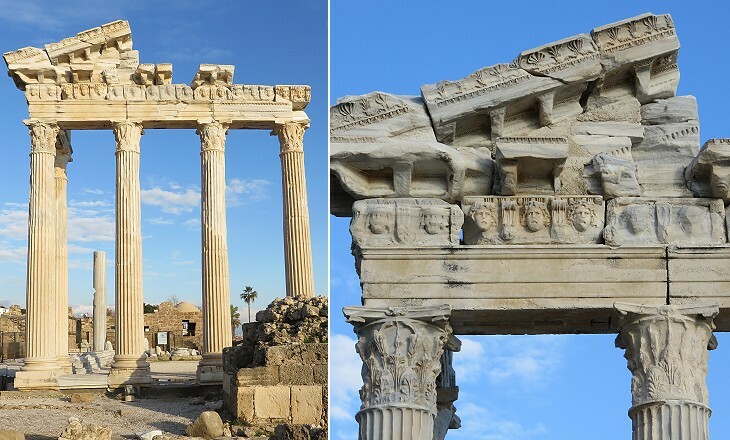 During the day, even in winter, the site where it stands is usually very crowded with people from the many beach resorts near the town or on a daily tour from Antalya, which includes visits to Perge and the Theatre of Aspendos. 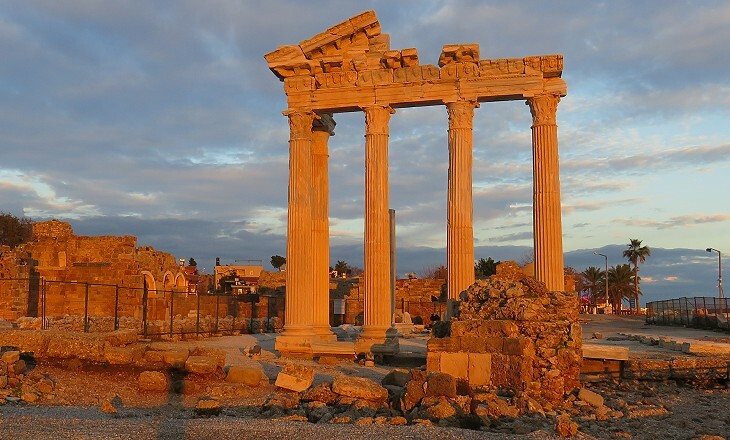 The Temple to Apollo was one of two adjoining temples built in the IInd century AD. The other one was slightly larger and it was dedicated to Athena. 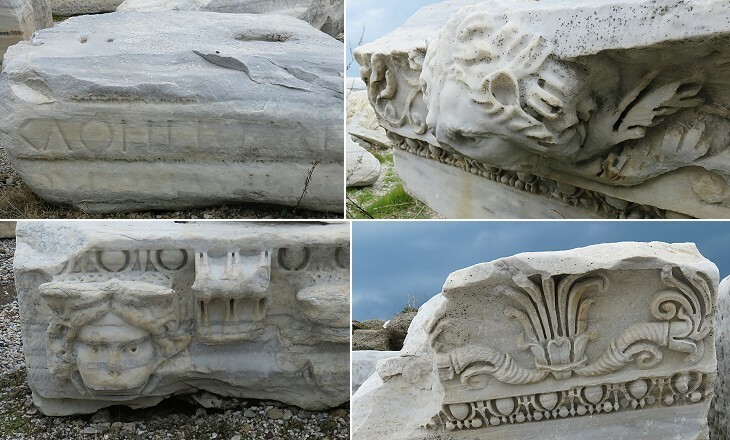 The temple to Apollo was decorated with heads of Medusa, similar to those at the Shrine of Apollo at Didyma. Parts of the decoration have been moved to the Archaeological Museum. 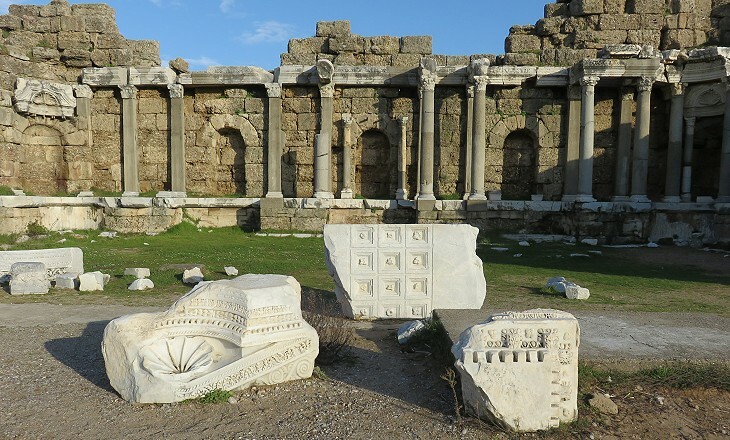 The temple was built during the reign of Emperor Antoninus Pius, at a time of great wealth for Side and when the use of coloured marbles, including pink granite and green cipollino, was very popular (you may wish to see a page on the Stones of Rome). 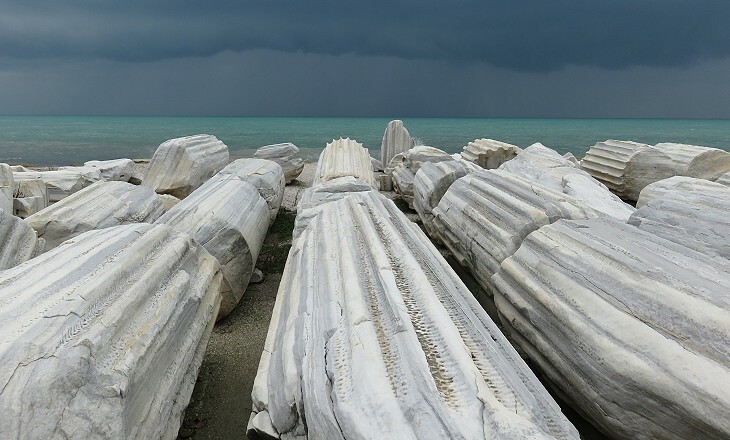 The temple however was entirely built by using whitish marble which was quarried on Proconnesus, an island in the Sea of Marmara. For this reason and because of its peripteros design (columns on all sides), similar to the Parthenon of Athens and the Sanctuary of Poseidon at Cape Sounion, the temple resembles an ancient Greek one. The rambling dwellers in tents could of course give me no information, except that lime was obtained there. I found several kilns, which are supplied from the cornices and capitals of columns, these parts being the whitest and the most easily broken up. The temples were damaged by an earthquake and eventually their stones were used in the Vth century to build a large church having the shape of a basilica with a nave and two smaller aisles. It was preceded by an atrium which stood on the site of the temples. Eventually a small church was built inside the nave in the VIIIth century. In the IIIrd century AD a temple having a semicircular shape and preceded by a small portico was built to the east of the harbour. It was dedicated to Men, a local god who was usually portrayed with a lunar crescent on his shoulders. 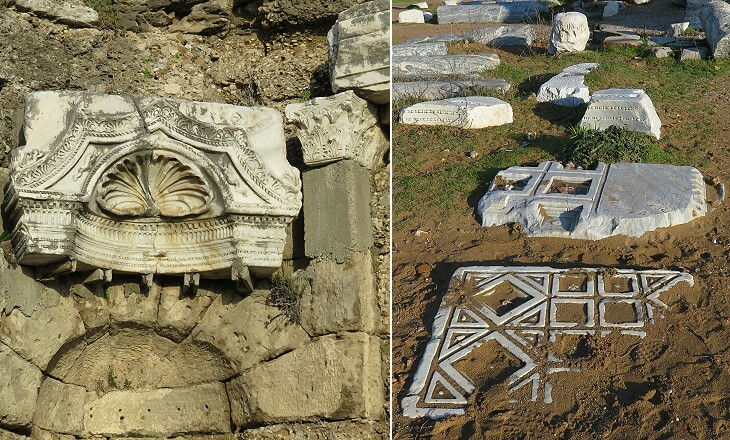 Reliefs portraying Men or a similar deity associated to the moon and the sun have been found in many locations of the Anatolian tableland (e.g. Isparta). The construction of this temple shows that during the IIIrd century the traditional religion based on the Twelve Olympian Gods lost ground versus beliefs of eastern origin with a special focus on astronomy and afterlife. 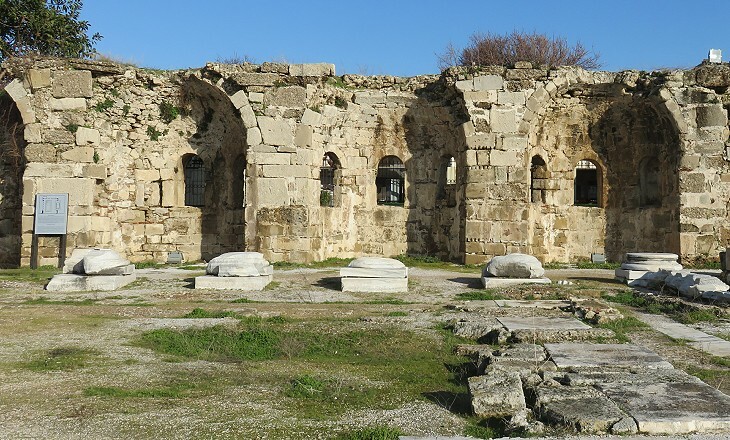 The aqueduct which carried water to the Great Nymphaeum and to the fountains near the theatre reached the harbour and allowed the construction of large baths in its proximity. In 1895 Side was repopulated with Muslim refugees from Crete; they built their homes on the area between the theatre and the ancient harbour, so that today the baths are surrounded by a maze of low buildings, which have been turned into shops and restaurants for the most part. The State Agora is situated near the sea at the south-eastern end of the Harbour Quarter. It consists of a large square courtyard surrounded by a portico. The front of a large building stands on its southern side. It had a decoration which recalls that of the Great Nymphaeum. Its niches housed statues of the Roman emperors or of local benefactors. A colonnaded street linked it to the Commercial Agora. 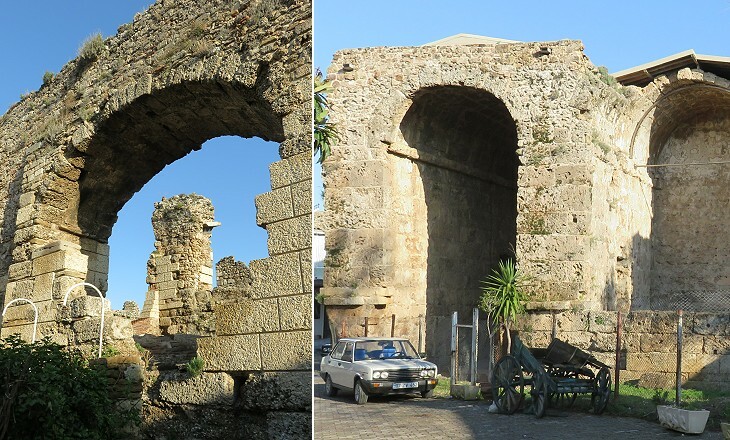 Most likely in the VIIth century the population of Side shrunk so much that the harbour quarter became its only populated area and some of the ancient buildings, including the theatre, were modified in order to use them as fortifications. 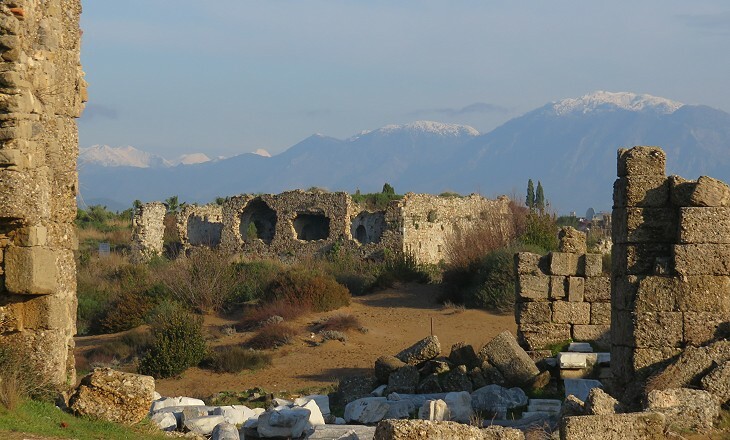 The State Agora was left outside the boundaries of the town and it was covered by sand dunes, so that Beaufort did not see it, while he noticed and described the ruins of the Commercial Agora. Even today one has the feeling that the sand dunes could cover it again in a short time. Move to 1. The Walls or to 3. The Theatre Quarter or to 4. The Archaeological Museum.